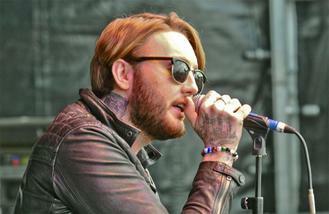 James Arthur plans on living out in the US to work on some songs he's been sent by Steve Aoki. The 28-year-old musician is still riding on the success of his latest record 'Back from the Edge', but he has already been working on some new tracks for his next one, and he has revealed he's been sent some songs by the 39-year-old producer, who he met through his One Direction pal, Louis Tomlinson. The 'Safe Inside' hitmaker plans on getting an Airbnb in America soon so he can work on the tracks. James told the Daily Star newspaper: "I really love it out there, I wish I was still there. "It feels so good to be recognised there because I have been inspired by so many American artists. "It's great working with people like Steve. He's been in the game for so many years and he is such a gentleman, such a genuine guy. "He showed me songs he thought I would sound good on, which is really cool. So hopefully we'll get something. "It'd be nice to get a p lace in the States, I've spent quiet a lot of time in over there and I will be in the next year or so just because this song ('Say You Won't Let Go') seems to be really taking off. It's on fire. I could get a fancy Airbnb or something." The hunky pop star recently said he "needs" to produce a "club bangers album." He feels he has written "too many heartfelt emotional ballads" and needs to start making music similar to Usher's more popular tracks, which are commonly played in nightclubs. He previously said: "I've made too many heartfelt emotional ballads. I need to make my Usher club bangers album". And the 'The X Factor' champion - who won the talent contest in 2012 - believes his success in the music industry has "trumped" everything he's ever done and has made up for any errors he has made during his career. He explained: "Music has trumped everything that I've done. It's made up for all the mistakes." British pop star Rochelle Humes has welcomed her second daughter, Valentina Raine. Pitbull, J Balvin, and Camila Cabello hit the streets of Cuba to party for their colourful new music video. Busted are to support Ed Sheeran at this year's Teenage Cancer Trust gig. Jamiroquai have released tickets for a second date at The O2 Arena in London after the first show sold out in less than a minute. Michael Buble's son Noah is "doing very well" following his treatment for liver cancer. A man obsessed with Taylor Swift has been arrested for stalking after allegedly climbing on the roof of her New York penthouse. Speech Debelle will release a cook book alongside her new album. Drake made a surprise appearance at The Weeknd's concert on Wednesday (08.03.17). Ed Sheeran has officially announced his North American tour will start with gigs in Kansas City on 29 June (17).